No Valentine's love letters, boxes of chocolates, thong underwear or a naked girl in bed for me. I was on the road before the crack of dawn pumped for some real fishing. After the annual late winter thaw all of the rivers blew out and flushed the ice out. Most of Steelhead Alley's streams were high and muddy. Considering I've been fishing plan B for several weeks, I was chomping at the bit for some river action. I knew of one stream that would be fishable in my book. It had been some time since I woke up really early in the morning and I struggled to get out of bed. A steaming cup of coffee and listening to Rush's Permanent Waves got me going. With it being Valentine's Day and high water, I knew I wouldn't have much trouble finding spots to fish. Most of the hubbies would be spending the day buttering up the old lady for a day pass tomorrow. I arrived later then usual as the roads were a little slick this morning and it didn't matter as I was the first person pull in. A short walk to the river and I noticed the level was slightly high and off color, but definitely fishable. Whenever water is that high and muddy, I run tandems and the sacs are super-sized to compensate for the lack of visibility and gives me more scent. It didn't take long to hit the first fish of the morning - a motley looking male. 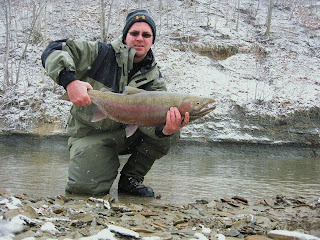 With it being this late in winter, most of the fish were very dark, battered looking and some probably got grinded by the chunks of ice flowing downstream. At the tailout, I noticed a couple of fresh redds and it's a matter of time before these fish are on the gravel. The action was decent, considering the conditions I was fishing in, no light takes and many were hard takedowns. I caught several large hens ready to burst and one started to drop eggs when I lifted her back into the water. The highlight of the morning was when I thought I snagged bottom. I pulled and nothing moved, I continued to pull and I was right to give the mighty tug when the line started to move. 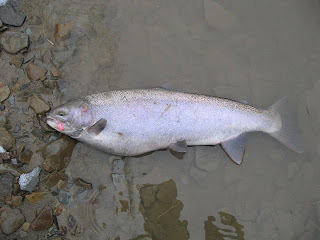 The fish started to move upstream and I knew I has something big on the other end. For 15 minutes I tried to pull it off the bottom and it continued to swim out into the current. At first I thought I foul hooked it and I finally got it to the surface and it was a large nasty looking male, I'm talking Frankenfish. He was heavily kyped with a massive head and had a thick upper body. He was definitely over 10lbs and was probably going to be the top dog on the redds. After fishing out that spot, I moved downstream and hit several more spots. The fishing was more tough as the water was higher than what I'm use to. I couldn't locate the shale ledges and the wind made drifting hard. I only managed another fish and I couldn't complain as I hit double digits and had most the river to myself. My exercising has paid off as I actually made it back without huffing and puffing. Not once did my shoulder and back bother me. On the way home, I drove over both the Grand and Chagrin Rivers. The Grand is still over its banks and will more than likely take a week before things settle down. The Chagrin was dropping, but the water is very muddy. I think by early next week everything should fish and we don't have to worry about -5F days anymore. Before you know it, we'll all be getting in as much fishing as possible before the fish are gone. Speaking of suckers, pretty soon the run of suckers will start in a couple of weeks. 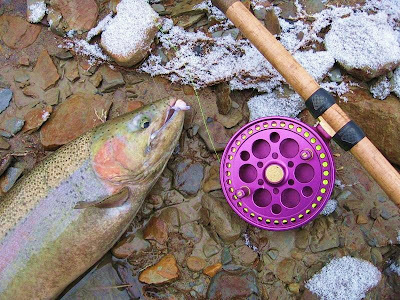 Every steelheader knows that suckers can clog up some of the best steelhead pools and it can be a non-stop snagfest. That is quite a fish!